5' 4" high by 1' 9" wide across the arms and 3" wide at the sides. 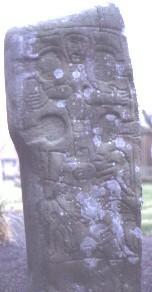 In the middle of the slab, not extending to the edges is a cross, on the cross there is a crude representation of the crucifixion. jesus is depicted with his limbs outstretched, straight. Below Jesus, on the left is a figure with two birds, on the right is a pincer and another object.